When facing an issue of pest control, savvy homeowners know to get help from the professionals. Expert pest control companies have the equipment, experience, and resources to control a pest outbreak with greater efficiency and effectiveness than most homeowners. But how do you choose the right pest control company when there are so many competing names on the market? The following checklist should provide you with guidance on everything you need to know before you sign a contract. From looking at licenses to evaluating customer service, make sure you choose the pest control service that’s right for you. 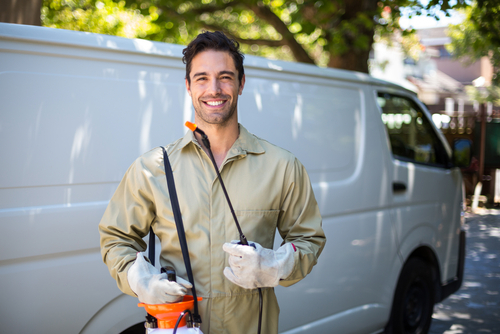 Most pest control companies will be quick to tell you that their business is the best around, but make sure you look for evidence of their quality in the form of a solid reputation. For big projects, ask your chosen pest control company whether they can provide you with references or testimonials from previous customers. You can also contact organizations like the Better Business Bureau to check if the company has had any complaints filed against them. All pest control agencies should possess a license from the state. Never do business with a company that doesn’t have a license. If you’re uncertain about a company’s license, check with California’s Structural Pest Control Board. You may also want to ask the company if their employees are bonded, which means you’ll be reimbursed for any damage they cause to your home. 3. Which Pesticides Do They Use? It’s important to make sure the pesticides your pest control company uses are safe and regulated. Ask the company about the active ingredients contained within the pesticides they’re spraying. You can request a safety sheet which provides information about any hazards commonly associated with the pesticides your company uses. 4. Do They Have Experience with Your Specific Pests? Different infestations require different skills. Some pests, like cockroaches and ants, are highly common, and virtually all pest control companies will have experience removing them. However, other pests are more rare, and it’s a good idea to seek out a company that has specialty skills or experience working with those specific situations. 5. Does the Service Offer Value? Looking for value from a pest control company is about more than finding the cheapest price. Find out whether your company can offer a free estimate for their services so that you can compare it against other providers. Additionally, ask whether their service is guaranteed. If pest infestations cannot be managed with a single visit, some companies will return to make sure the job gets done. Be sure you know exactly what they are promising to do before bringing them into your home. 6. Will You Need to Sign a Contract? Some pest control companies will ask their customers to sign an agreement that requires full payment up front. If you are asked to sign a contract, make sure you check the details of that contract in full before handing over any money. A reputable pest control company should allow you to cancel their services whenever you like. 7. What Is Their Approach to Safety? Safety is crucial when working with any pest control company. Make sure your chosen service follows the correct precautions. Ask them about their ability to provide green or low-toxicity options, and look into whether they have insurance that can cover your property, your family, and their employees. It’s also a good idea to check that they’re responsible in preventing accidents and wearing the correct equipment. 8. Will They Suggest a Treatment Program? Pest control companies are experts, which means they should be able to suggest a “plan of attack” for you to consider before you sign a service agreement or contract. This plan of attack should explain any treatments that will be used and where they will need to apply those treatments. 9. What Customer Service Can You Expect? Finally, make sure you can expect high quality service from your chosen company. Will they listen to your concerns and address them respectfully, and is the company available to answer any questions you might have via email or phone call? Contact Adios Pest Control today to learn more about our extensive pest control services. Our years of experience makes us the ideal choice for pest removal in San Diego County.